Do you ever need an idea for what you could do with a holiday character like Santa, reindeer, snowman, or another stuffed animal? Here are some WINNERS to target a variety of early language skills. Therapist who work in a clinical or school setting probably choose to forego stuffed animals for obvious (germy) reasons, but for those of us who see kids at home, ideas like this can be a lifesaver when a child is already playing with this kind of toy. In addition to the character, grab yourself a few everyday items such as a spoon, cup, blanket, wash cloth or wipe, etc… A small box with lid or a bucket will also be fun. The child will exhibit joint attention for longer periods of time. The child will respond to a simple “Give me” request with fewer cues over time. The child will imitate familiar actions during play. The child will follow one step directions with familiar actions during play. The child will begin to sequence actions during play. The child will request a new turn using nonverbal gestures, signs, or words. The child will begin to use words to complete automatic speech tasks in verbal routines during play. The child will imitate easy vocalizations during play such as animal sounds and exclamatory words. The child will identify objects by function. Begin by introducing the character. A hiding game or playing peek-a-boo with the character can provide an opportunity to “call” the character and establish the character’s name. Call the character’s name many, many times. Place your hands around your mouth as if you’re yelling as you “call” the character. Help a toddler imitate this gesture with this activity. If a child doesn’t usually follow commands, begin with simple requests. Tell the child, “Give me Santa.” If necessary, help the child place the toy in your open hand with your other hand. Once a child is completing a few of those routines with you, move to other routines with objects. In the video I modeled what I would say to teach familiar actions like eating, drinking, and sleeping. Your goal is for the child to imitate your actions and begin to try to repeat the easy play sounds you’re modeling. Other slightly more difficult directions to try include: washing Santa with a wipe, putting glasses on Santa, covering Santa with a blanket, putting a band aid on Santa, brushing Santa’s teeth with a toothbrush, etc… These steps are an important part in learning to sequence actions in play. Feed Santa and then wash his mouth. Rock Santa and then put him down to sleep. 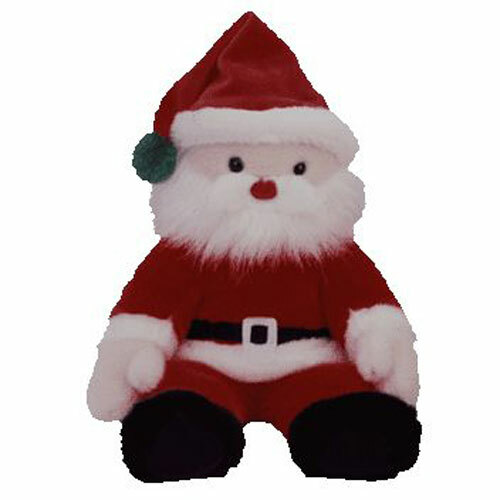 You can also target verbs or action words with Santa by making him walk, jump, dance, run, fall or climb. By introducing a box or bucket, you can help a child understand and use prepositions or location words such as in, out, off, on, up, down and under. Expand this activity by using more than one character. If you’ve played with Santa, add a snowman or reindeer and do the same activities. When giving directions and working on comprehension, you’ll add another level of complexity by performing the same actions with a new character. If a child is beginning to do some pretend play on his own, you can expand this further by cooking for Santa in a pretend kitchen using plastic foods. This step is also critical in helping a child learn to sequence actions in play. The child can select a food, pretend to cook it, and then feed it to Santa. Introduce surprises into play routines. Have Santa refuse the food or ask for something other than what the child offered. When you’re putting Santa away, try this song, “Bye bye Santa. Bye bye Santa. Bye bye Santa. It’s time to say bye bye.” Model the gesture for waving too and for blowing kisses. If a child is already imitating single words as you play, use this activity to elicit requests for Santa, another character, or the other objects needed to complete play routines. Remember after Christmas time to transition these same play routines to other toys like baby dolls, a stuffed animal like a bear, another plush toy like Elmo, or even Thomas the train. If a child is a little older, you could use a super hero such as Batman or Barbie. If a child does not complete your requests after you model and teach the action several times, provide physical assistance by helping the child imitate your action. If you fail to elicit any attempts to follow directions, then the child is likely exhibiting a receptive language delay and perhaps social delays as well. Don’t be fooled into thinking that a child is choosing not to participate or doesn’t like the activity. You’ll have to do even more to help a child like this begin to link meanings with words so that he can understand and then follow your commands. For more therapy ideas, check out my therapy manuals which explain step-by-step instructions for play routines that target language.